← One Direction: fleeting infection or everlasting obsession? Gone are the days of one-way marketing where simply writing a clever ad is enough to attract and retain consumers. Many consumers seek rich consumption experiences. They want to be captivated, involved and romanced. Furthermore, many consumers don’t want to consumer in isolation, they want to get involved with other like-minded people. Accordingly, some companies are designing “experiences” to interact with their current and potential customers. These experiences also enable consumers to form a communities with others and effectively creating experiences for them to “live” the brand. Although these brands emerge in diverse industries, they are similar in that they create and foster communal and sensory experiences for their fans to live their brand. The athletic clothing company Lululemon has become something of a phenomenon. Their mission is to “create components for people to live long, healthy, and fun lives”. Along the way, they also sell clothes – some $450 million in the last financial year across 142 locations. Lululemon is not an average retailer and their success is largely due to their commitment to creating a distinct and rich consumption experience. They run free yoga classes for their which are religiously attended by fans that wait for hours (and are often turned away when the class quickly reaches capacity). And the interior of the stores look less like Kmart and more like a serene yoga retreat – complete with drinking fountains, thriving plant life and local produced, Lululemon-inspired artwork. A visit to Lululemon is a sensory and communal experience, which the company has worked hard to cultivate. Customers, current or potential, are romanced by the in store experience, become linked to its community and become strong advocates of the brand. TV is no longer just a one-way broadcast medium. The advent of reality TV has given fans the opportunity to audition for their favourite show, and others the opportunity to decide their fate from the comfort of their lounge rooms. However the first production to combine view participation, reality TV and fictional narrative is Glee. Through the Glee Project, the millions of ‘Gleeks’ audition for the show in the hope of joining the narrative version Glee, whilst their fate is decided by fellow fans who vote for the newest cast member to join the show. It has helped foster a community of “Gleeks” by making the experience more than simply a television show. It’s a interactive community where fans actively drive the narrative. Some brands try and create an experience by using military tactics, enlisting customers and getting them to pay to crawl through the mud and climb obstacles. No I’m not talking about a One Direction concert – it’s Tough Mudder, the brainchild of Harvard Business School buddies Will Dean and Guy Livingstone. Groups of (mainly) males sign up for the event and form teams and help their fellow comrades complete the course. 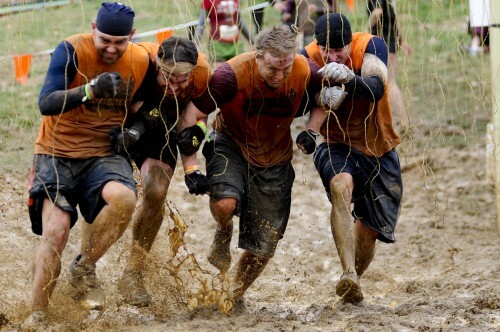 Obstacles include “electroshock therapy”, the mud mile and variations of climbing, running and swimming challenges. As the organisers say, it’s not a race but a visceral and physical experience for those who are seeking fulfilment in a life of bland office drudgery. The brand has experienced tremendous growth over the past 3 years, going from a single event in Allentown PA to in excess of 40 locations worldwide. Clearly if you’re going to charge a premium to climb through the mud to experience your brand, it better be worthwhile. So whether your brand is aimed at fitness fanatics, tweens or part time superheros, creating a communal and sensory brand experience can help you market to the more powerfully. Grill’d Burgers: Just how healthy are their "healthy" burgers?